Think small — really small — and you’ll get some idea of the pieces that come together to make up the San Diego Model Railroad Museum in Balboa Park. At the same time, though, you have to think big — as in the size of John Spreckels’ bank account — to understand the background of San Diego’s rail history. It all comes together in the 27,000-square-foot museum in the heart of the park. On the lower level of the Casa de Balboa building, which also houses the Museum of Photographic Arts and the San Diego History Center, it is one of the largest indoor model railroad displays in the world. 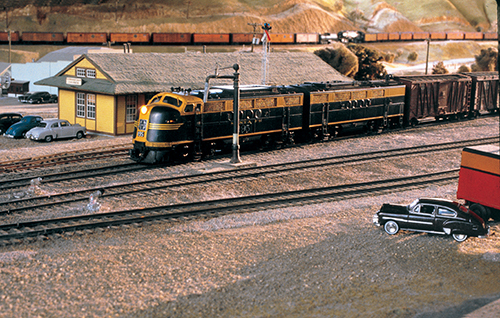 Opened in 1982, its mission is to promote the understanding of American railroads through representations of Southern California’s railroads and to preserve the history and traditions of model railroading, according to executive director Anthony Ridenhour. A big part of the story is captured in “San Diego & Arizona Railway: The Impossible Railroad,” written by UCSD biostatistician Reena Deutsch, who happened upon the rail system while she was hiking in the Anza Borrego Desert. Her book tells the story of the railway championed — and paid for largely — by Spreckels, who had moved to San Diego after the 1906 San Francisco earthquake destroyed much of his business empire. Spreckels had already invested in the San Diego Electric Railway and designed the streetcars for the 1915 Panama-California Exposition. He recognized the need for a rail line to link San Diego to the east — without going through Los Angeles, and teamed up with the president of Southern Pacific Railroad, E.H. Harriman. They funded the project with money from the Southern Pacific Railroad, unbeknownst to those in the company. Building the rail line across treacherous terrain, from the mountains to the Anza Borrego Desert and into Mexico, was tough enough, but when the economy hit rough roads in 1907, the project screeched to a halt and seemed to add truth to the “impossible” label it had been given. After Harriman died and Southern Pacific executives found out they had been paying the tab, Spreckels stepped in and built it himself by selling some of his businesses and skimming profits from others, Deutsch said. “He was such a good businessman, but this was an obsession,” she said. 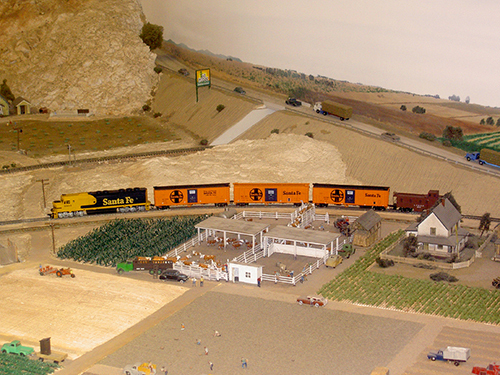 Today visitors to the San Diego Model Railroad Museum can watch the HO scale layout — 1/87th of the actual size — cross the desert and climb the hills. There’s even a 10-foot-high model of the Goat Canyon Trestle that crosses over the Carrizo Gorge. It still exists today and is part of the Desert Line of the San Diego and Arizona Eastern (SD&AE) Railway that is currently being upgraded, Ridenhour noted. And don’t miss the N-scale — 1/160th actual size — model of the Pacific Desert Lines with 10 scale miles of tracks that are only 0.040 inches high. Special exhibits and events rotate in, such as the one running through Nov. 22, “Life on a Circus,” or the Halloween Haunted Express. Family days are organized around those special events, Ridenhour noted. 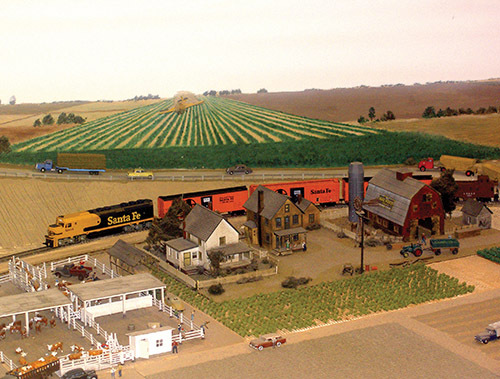 Plans are in the works for a high-tech, “talking exhibit” for the 2015 Balboa Park Centennial Celebration that will re-create the park in G scale — 1/32 actual size, he said. It calls for some features produced by 3-D printing and a mobile app that will interact with structures throughout the display — think being able to make the organ in the Spreckels Pavilion play a 1915 concerto on your smart phone. Ridenhour said they need to raise an additional $100,000 to make the plan a reality and also to make the exhibit a permanent part of the museum. Among those volunteers is Fred Humes, a member of the Coronado High School class of ’59 and a part-time Coronado resident who retired as an Army lieutenant colonel and then worked as a Chula Vista Elementary School District administrator. In an e-mail written for this magazine, he wrote “A Coronado Model Train Enthusiast’s Story,” in which he talked about getting his first Lionel train from Santa in 1946 and adding to it until his interests “turned to cars and airplanes.” The rails, tracks and other features were packed away from 1954 until 1998 when he mentioned them to his wife, Lauralee (Smith), CHS Class of 1960. But by summer, with “the directive from conductor Lauralee,” all the pieces were packed away, leaving him as “an engineer without a railroad” — until he discovered the museum in Balboa Park and a club called the 3-Railers. Now, he continued, he can “run my O-gauge trains on a world-class layout and the museum visitors can enjoy the trains as much as I do. Tuesday–Friday, 11 a.m. to 4 p.m.
A model of a Santa Fe freight train passes by a cattle yard on the San Diego & Arizona Eastern, known as “The Impossible Railroad. An HO-scale model of the San Diego & Arizona Eastern Railway passes through El Centro in one exhibit. 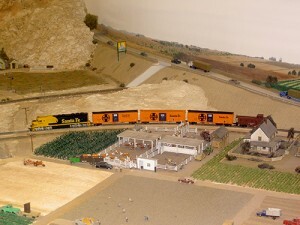 An HO model of a Santa Fe freight train with a color scheme known as “black widow” makes its way by a model of the Caliente station on the Tehachapi pass exhibit. Photos of the prototype were used to make the landscape match the actual area as closely as possible.